Harry Pidhirny was a 2011 inductee into the AHL Hall of Fame. His one season skating for the Reds was towards the end of his brilliant career, registering 13 goals and 36 points in the regular season and playoffs. Harry was a durable and reliable center whose numbers were as good as any player of his time. He played in a remarkable 1,071 games over 17 seasons in the American Hockey League. Beginning with the1949-50 season, he put together a string of 12 consecutive 20-goal campaigns. 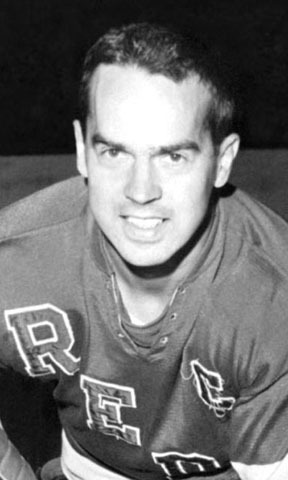 In 1953, Pidhirny tied an AHL record by scoring six goals in a 9-1 win over our very own Reds. He played in five AHL All-Star Games during the 1950’s. He played two games with the Boston Bruins in 1957-58, his only taste of the NHL in his career. Pidhirny ranks third in AHL history in games played, sixth in goals (376) and seventh in points (829). He was a member of the first class of inductees into the Springfield Hockey Hall of Fame in 1996.